So, as I posted on my Facebook account last night, I remember when UVA used to beat other football teams 23–3, not get beaten by that amount. Sigh. Other traditions: in times past, the first concert of the Virginia Glee Club’s season was called the Kickoff Concert, and the program featured traditional university songs as well as the Glee Club’s normal classical repertoire. Now? Apparently, the Virginia Choral Showcase is the order of the day instead. Sensible in that it makes sure that there isn’t a glut of choral concerts competing for audience, but I bet it limits the groups’ ability to perform bigger works for that first concert. It also eliminates one crucial opportunity for working with visiting choirs. But then, maybe I’m just biased. Fifteen years ago, I was just getting started as the Vice President of the Glee Club, a position whose chief responsibility then was concert publicity, which for us largely meant posters. So I learned how to design posters. I inherited a big cardboard portfolio of posters with designs that had been used and reused for many years. Most were hand drawn; all had some level of nostalgic meaning. I thought that the posters didn’t stand out, and that they didn’t project the kind of image that director John Liepold and I thought the group should claim: professional, an important part of the University, fun. The first poster of the year was for the Kickoff Concert. So to replace the hand-drawn image in use for several years prior, I went searching in Special Collections at Alderman Library for old pictures of the football team. 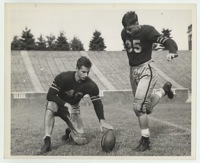 And I found the shot attached to this post, an actual football kick (albeit in practice). I surrounded it with sans serif typography—Franklin Gothic Condensed, letterspaced, a favorite— in homage to a famous Elvis Presley poster of about the same vintage as the photo. It was great. We used it for two seasons while I was there. Then the group moved on to other images and eventually stopped doing Kickoff Concerts. I found the image again recently while working on a Wikipedia article. It hit me again the same way it did back then, an immediate punch. And I thought about change, and how the immediacy of an image can fool you into thinking that things don’t change. But of course they do, and you can change with them or stay out of the way.